The University of Melbourne provides staff premium access to Poll Everywhere, an online tool that allows users to create and collect responses to poll questions or activities. Polls can be activated and distributed in a live session and through the LMS. 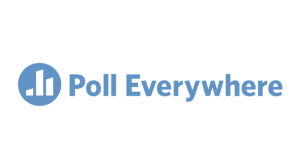 Poll Everywhere is an online tool that allows users to create and collect responses to poll questions or activities. In a live session, poll responses can be collected by displaying a unique Poll Everywhere link belonging to the presenter. Polls and activities can be created on-the-fly or prepared earlier, and the presenter can control which of their polls is active at any one time. To respond to the poll, participants access the presenter's link using their mobile devices or computers. Staff can display responses in real-time, allowing for an interactive session between presenters and participants. Poll Everywhere can be used in teaching and learning, for example during a lecture, to assess prior knowledge, obtain preferences, or check on student's understanding of concepts as they are taught. In any style of live session, polls can be displayed from the Poll Everywhere website or embedded in a PowerPoint, Keynote or Google Slides presentation. Alternatively, a poll can be used to to gather responses outside of a live session by embedding a poll or sharing a URL in an LMS subject, on a webpage or sent in an email. Using Poll Everywhere in large lectures: One academic's story - Poll Everywhere was trialled in a large Biosciences subject using a range of implementations in workshops and lectures. Poll Everywhere utilises single-sign-on. All University of Melbourne staff and students can access Poll Everywhere using their University username and password at the Poll Everywhere/Unimelb login page. Once you have activated your account as a University of Melbourne user, click the 'Polls' tab to start creating polls. Poll Everywhere is supported by Learning Environments. Any questions regarding accounts, usage and training can be submitted through the LMS LMS and Learning Technologies support request form.